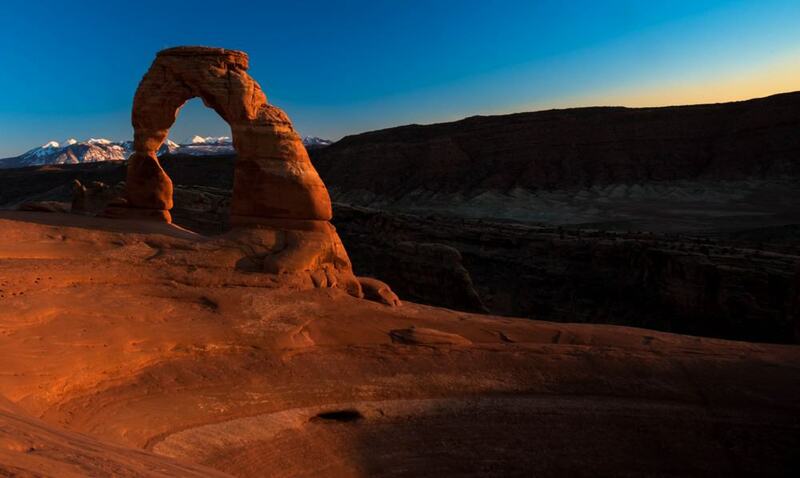 Arches National Park hiking trails are perfect for the avid hiker, causal visitor and families traveling with kids. Arches falls right in the middle of Utah’s five parks as far as visitors go, but it feels busier because it’s on the smaller side. This was the first national park I ever visited and it’s still one of my favorites in Utah along with Capitol Reef. 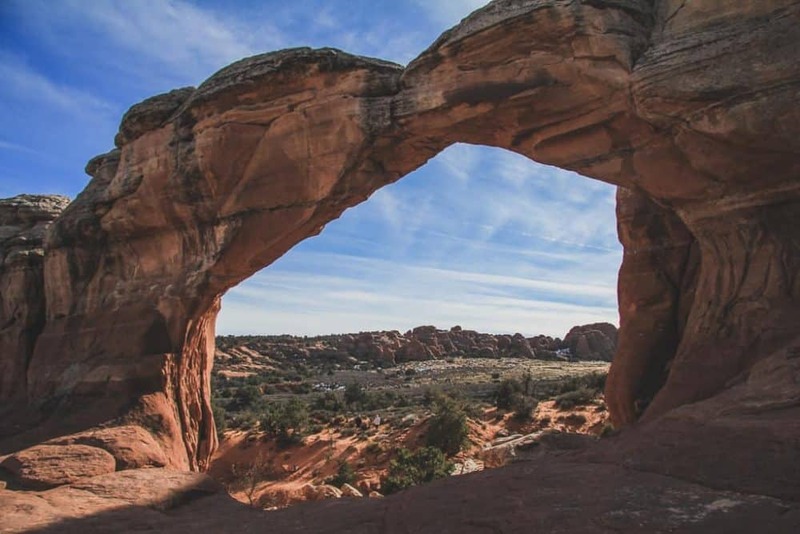 The entrance to Arches is about 4 miles outside of Moab, Utah, USA, and Canyonlands Island in the Sky is only 26 miles away. Help protect the cryptobiotic crusts in the park by leaving no trace and staying on established trails. There is plenty for you to see, do and photograph in Arches since there are, after all, over 2,000 arches in the park. Some of the links on this site are affiliate links, meaning if you book or buy something through one of these links, we may earn a small commission – at no extra cost to you! Read the full Disclosure Policy. This list of hiking trails at Arches National Park starts at the beginning of the park. The first hike you’ll come to on the scenic road will make you feel like you’re in an old western movie. The Park Avenue Trail follows the bottom of a canyon below some of the park’s gigantic and well-known monoliths. 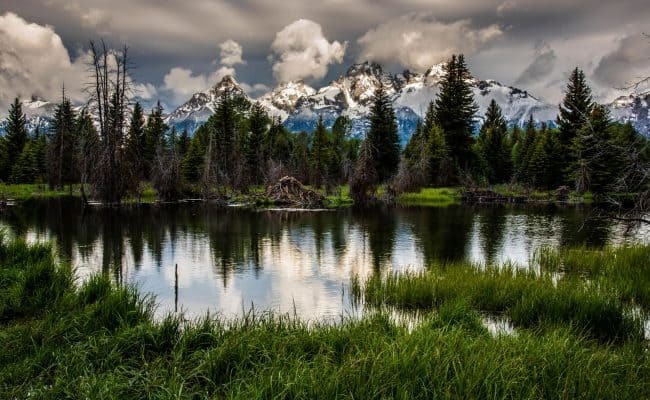 It’s a memorable experience to hike through these towering natural wonders. The Park Avenue hike is a one-way trail if you have two cars or a shuttle vehicle. The trail is a little over one mile taking you from the Park Avenue trailhead to the Courthouse Towers parking lot. This is where you would leave your second vehicle or have someone that doesn’t want to hike pick you up. If that’s not an option, just head back the way you came through the towering sandstone for a nice 2 mile round-trip adventure. 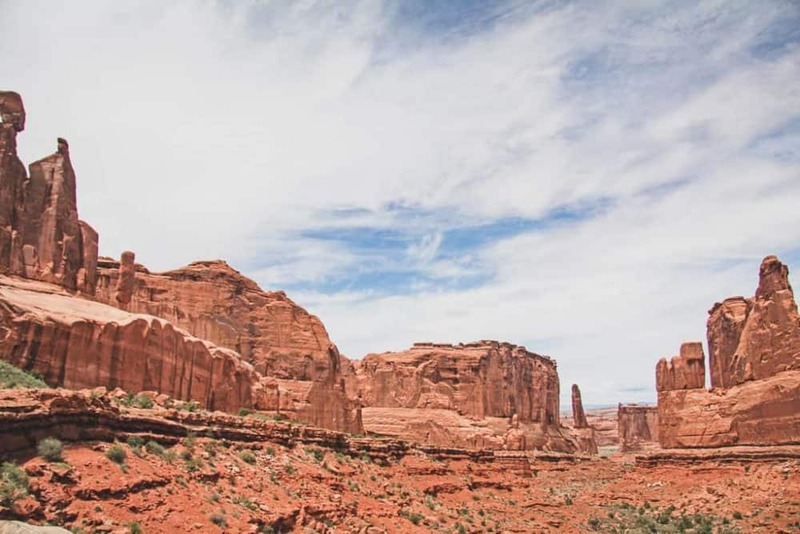 The latter part of the hiking trail has good views of the famous Arches landmarks: The Organ, Tower of Babel and the Three Gossips. 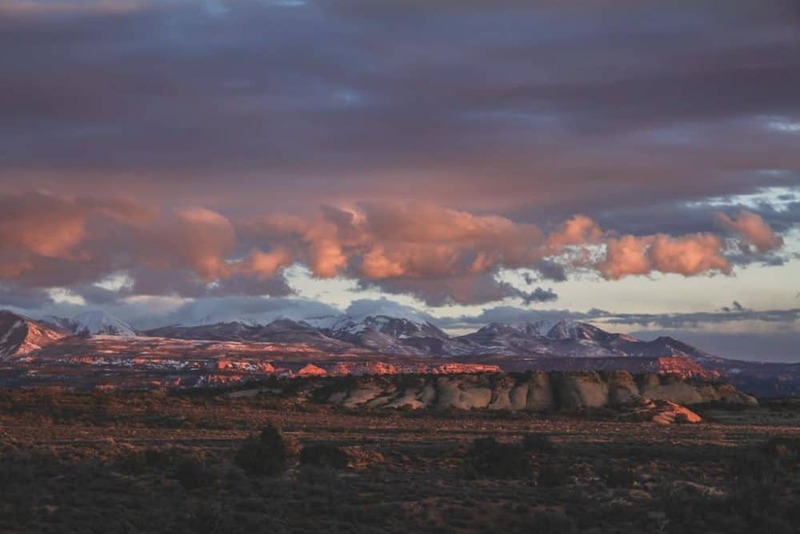 The La Sal Mountain Viewpoint isn’t really a hiking trail, but it’s worth the time to walk around the area. You will see magnificent views! It’s a great place to watch the sunset as you’re leaving the park. You can see the colors change over the mountains in the distance with Park Avenue behind you. It’s also a wonderful location to photograph the red glow on the rocks at sunrise. There is a small flattened section overlooking the scenic drive. 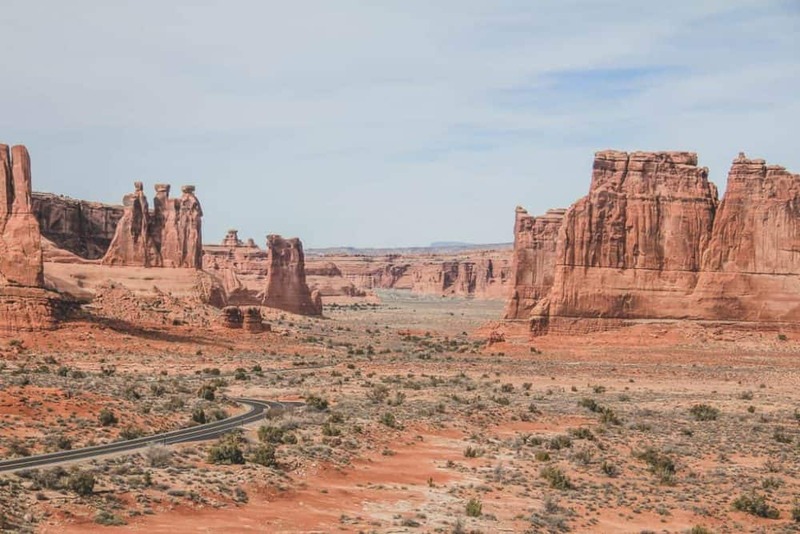 The signs lay out the names of the formations in front of you: Three Gossips, Sheep Rock, Tower of Babel, and you can even see Balanced Rock and The Windows in the distance. 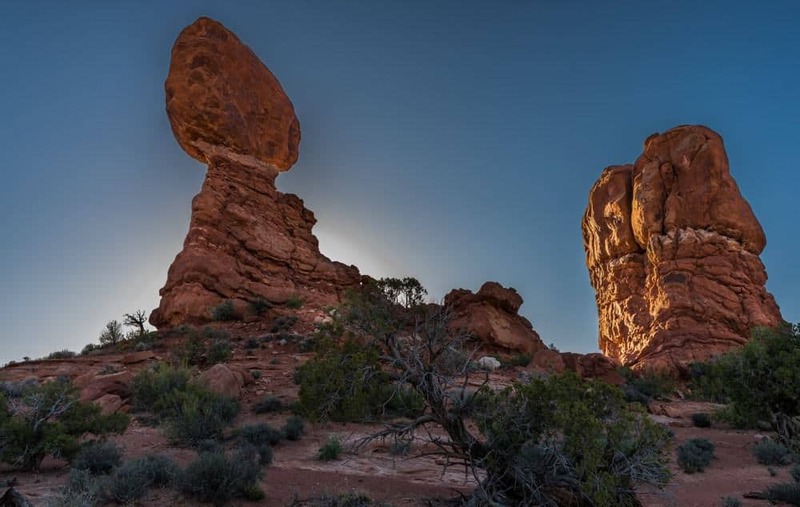 Balanced Rock is an easily recognizable landmark of Arches National Park. Many people park in the lot, take a photo, and move on. 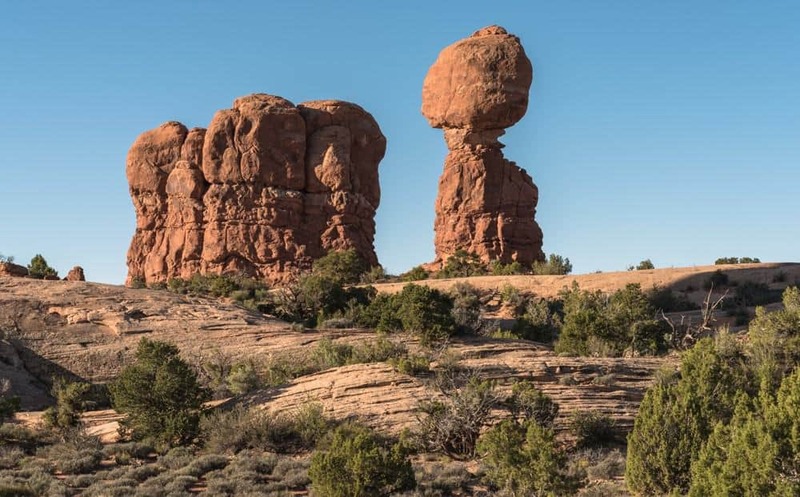 It’s definitely worth the time to walk along the Balanced Rock trail. It’s an easy, short loop hike that takes you close to and around the Balanced Rock. Each vantage point along the trail showcases a different side of Balanced Rock. And don’t forget to Visit the Park After Dark. 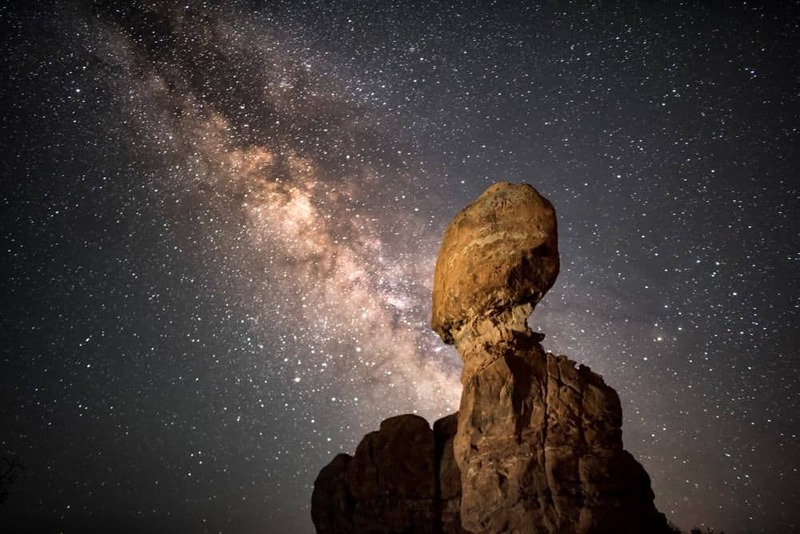 You’ll be amazed at the stars in the sky at Arches National Park! The Windows Section of Arches National Park is a cool area with a lot to see. The Windows Trail loop is under 2 miles. It’s one of the most popular areas in the park, and the parking lot fills up quickly. It’s best to hike the Windows trails in the morning, late afternoon or evening to avoid the crowds. In this area the main attractions are the North and South Windows where you can stand under the large South Window. There is also a loop trail that circles around the back of the Windows Section that gives hikers a different perspective of the area. The Windows Loop trail also takes you to Turret Arch. On the other side of the Windows parking area is the Double Arch trail. It’s easy and super short. You can see it from the parking lot, but you’ll definitely want to get up close to this one. It’s exactly what it sounds like, two arches basically next to each other. Again, if you want to have this area to yourself to climb and explore, get there in the morning or evening. 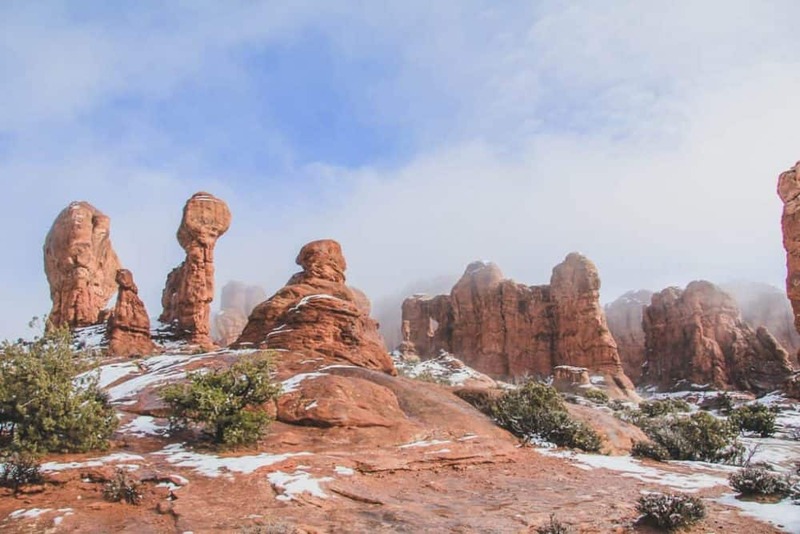 Arches National Park in the winter is the best time to visit if you want to avoid the crowds. The Garden of Eden area is easy to miss as you drive to the Windows section. 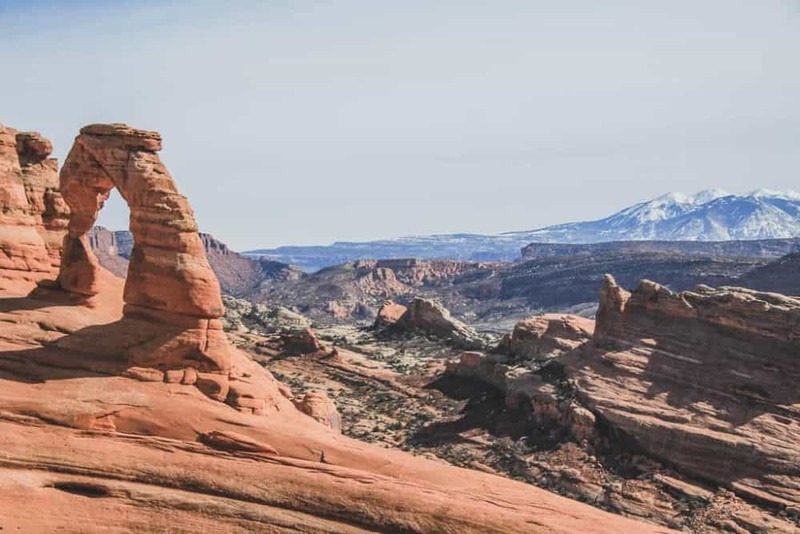 The Garden of Eden area is called a viewpoint, but it’s also an open trail where people can explore the sandstone features on the desert slickrock. You can see arches just starting to form all over this area. As you walk around, remember to stay off the cryptobiotic soil. Owl Rock is popular with rock climbers. Watching them provides another fun aspect of this overlooked turnout. Another reason to visit Arches National Park in the winter is to take photos of the red rock with the contrasting white snow! It’s so beautiful. If you don’t hike to Delicate Arch, did you really visit Arches National Park? I’m not so sure. The Delicate Arch trail is a must-do hike in the park, and it will always be busy. The Delicate Arch hike is three miles round-trip. It isn’t horribly difficult, but it’s super steep, so wear good shoes, drink lots of water, and take your time. Delicate Arch can be hard to photograph without people in it, but it can be done. Usually people are good to wait in line taking turns to get their picture taken under the arch. The trick is to wait for the people to move away from the arch as the next people in line move toward the arch. You’ll only have a brief moment to capture the photo so be ready! Also, don’t be afraid to walk around and see and photograph Delicate Arch from different angles. If you can’t hike the Delicate Arch trail that takes you right to the arch, you can see the arch from the Lower Delicate Arch Viewpoint. The viewpoint is about 100 yards from the lower viewpoint parking lot where you can see the arch about a mile away. You can access the Upper Viewpoint Trail from this same location. It’s a short .5 mile hike with a few stairs to climb. It will get you a little closer to the arch, but you can’t get all the way to Delicate Arch from here. But it does provide a slightly less obstructed view from what you see at the Lower Viewpoint. 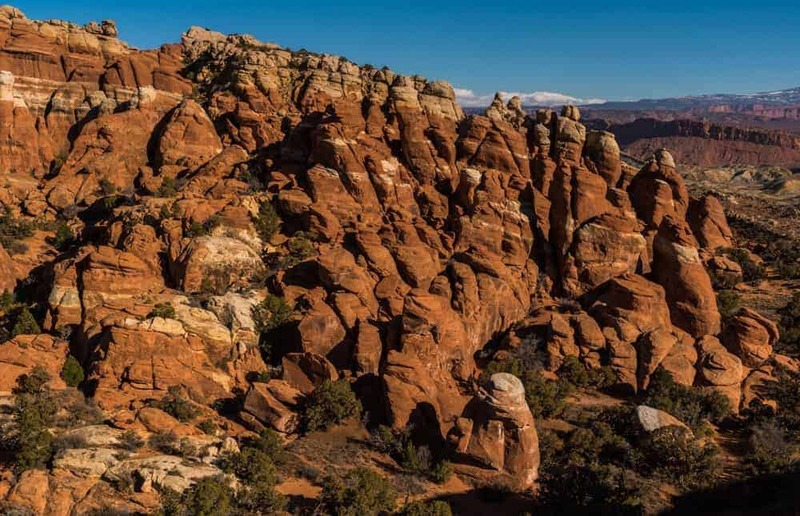 The Fiery Furnace hiking trail is a great option for people that want to get off the beaten path at Arches National Park. I wouldn’t call this a trail, but more of a wandering free-for-all maze. 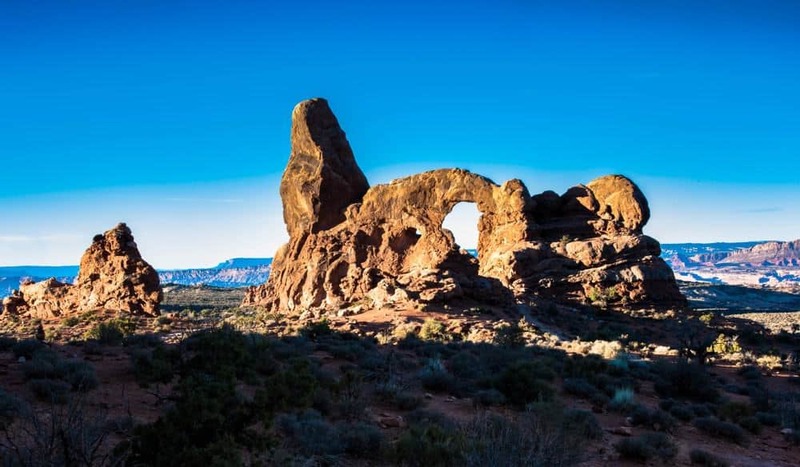 This is the only hike in Arches that requires a permit. 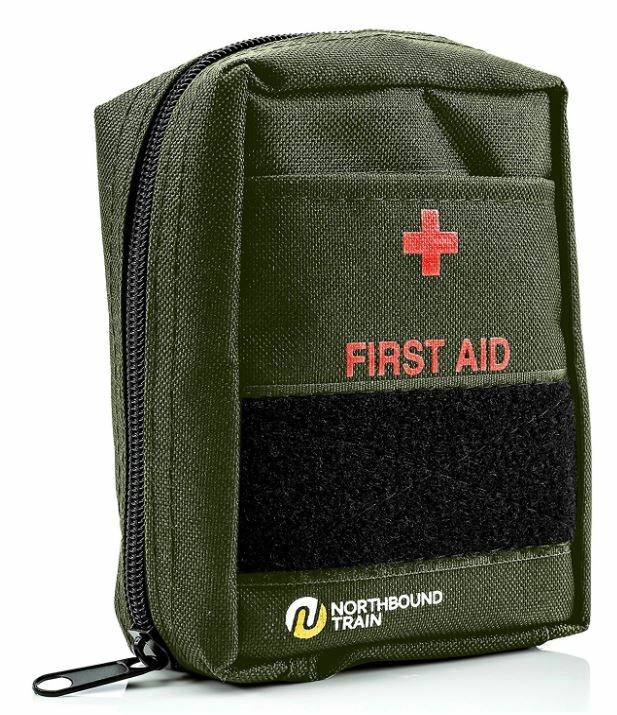 It can be purchased at the Visitor Center. The Fiery Furnace area is made up of a bunch of fins, which are huge sandstone things that look like dragon scales, in rows with small canyons between them. You can basically just wander around this area wherever you want (with your permit), but it’s possible to get lost, so pay attention to where you’re going and where you came from. You’ll find hidden arches in here so keep an eye out for those! 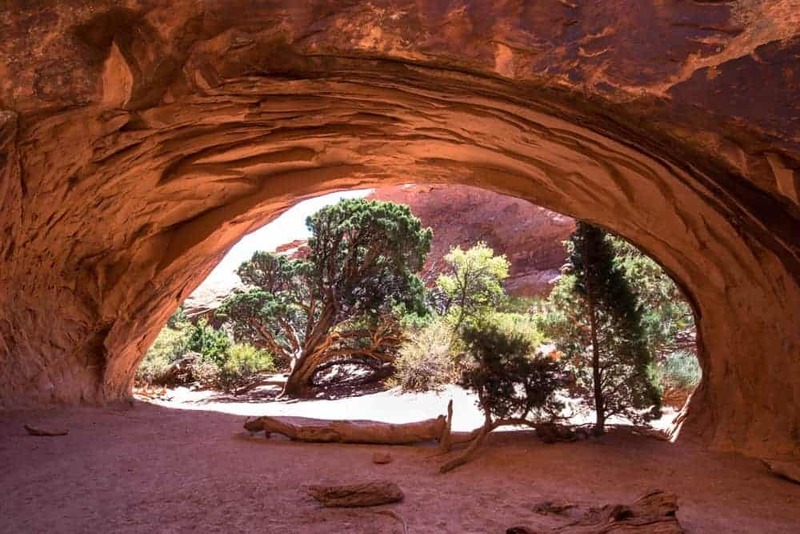 The Sand Dune Arch trail is a spur off the Broken Arch trail. 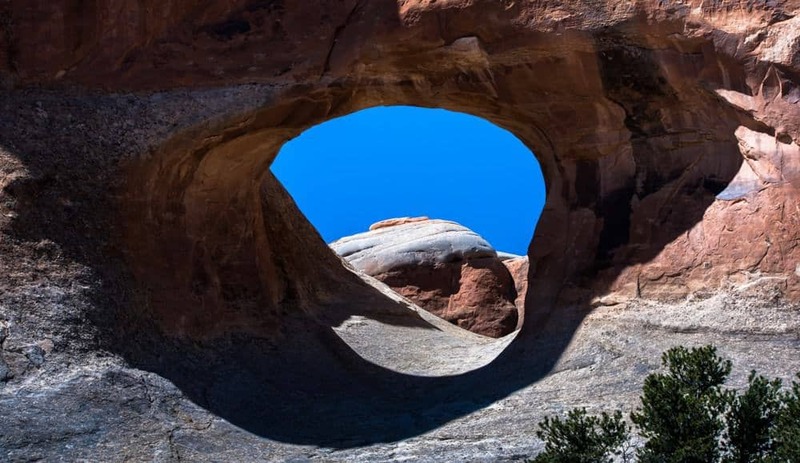 It’s a fun and unique hike because the arch is located in an ‘almost’ slot canyon. 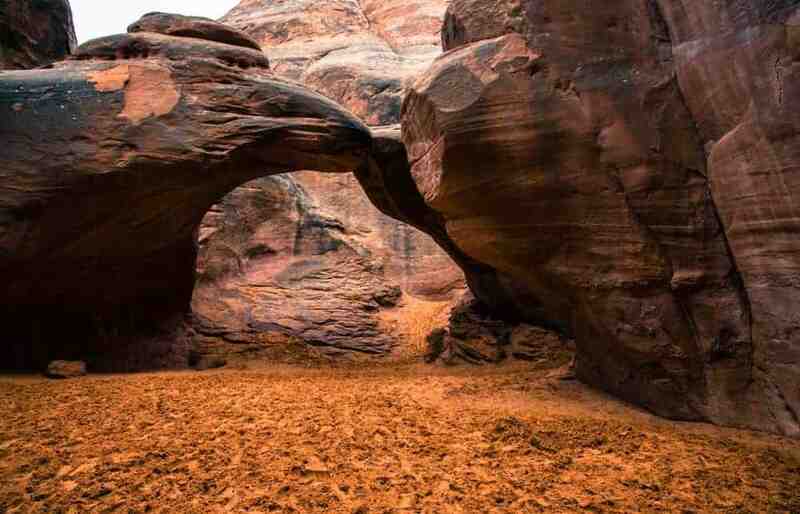 As the name implies, it has quite a bit of sand around the arch. Sand Dune Arch sits in the shade for most of the day, which makes it the perfect place to rest, take off your shoes and enjoy the cool sand. The Broken Arch trail continues past the Sand Dune Trail. This trail often gets bypassed, but it’s an easy, flat hike and you won’t encounter many people on it. After reaching Broken Arch, go through the arch and make sure you look back through it. It’s a pretty cool view from there. 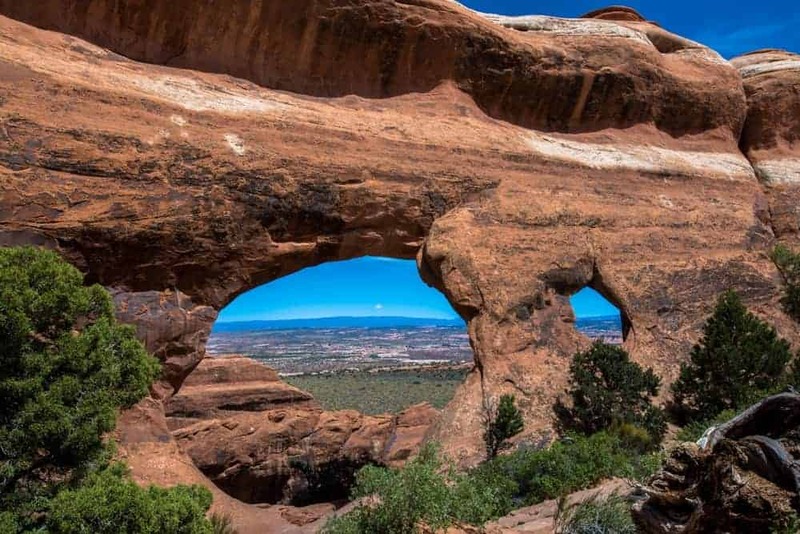 You can also hike to Tapestry Arch and the Devil’s Garden campground from here. Finally, you have the Devil’s Garden Trail. 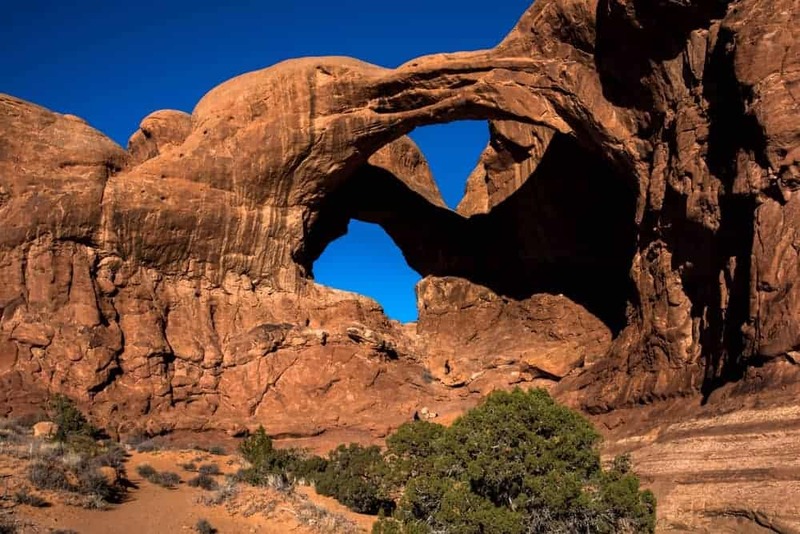 The whole Devil’s Garden loop is a little over seven miles and has at least seven arches to see along the way. 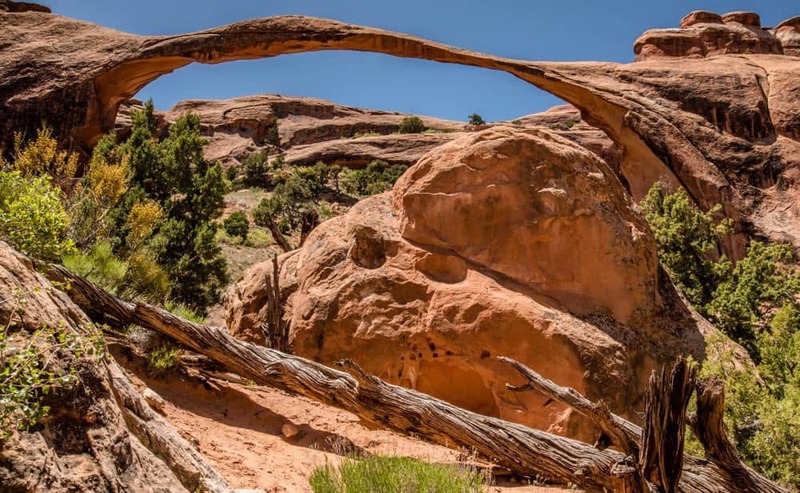 Most people just go to see Tunnel Arch and Pine Tree Arch, the two closes arches along the Devil’s Garden Trail. Then a few more people continue hiking to see Landscape Arch, another very notable arch in the park that may collapse in our lifetime. Not many people hike past this point. If you want a trail to yourself, or close to it, this is a good option. And you’ll see more amazing arches like Navajo Arch. 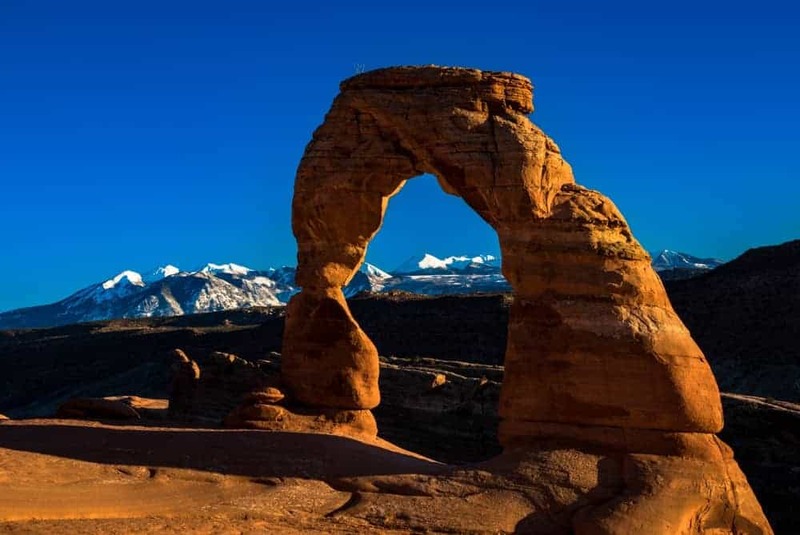 Arches National Park is a small geographic area, but has the greatest concentration of stone arches in the world. 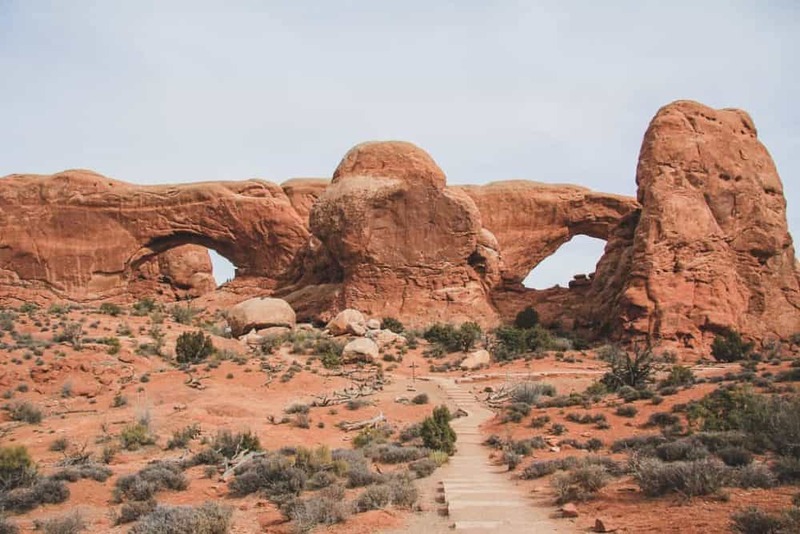 The condensed are means the hikes in Arches are not very long, but you’ll rewarded with fins, domes, towers, bowls, slots, caves and more as you walk along the trails. 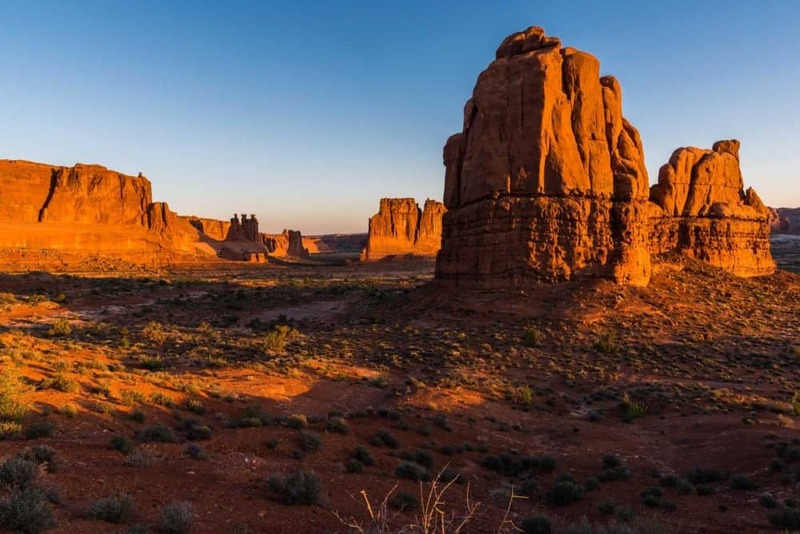 While most visitors don’t venture far from the Scenic Drive, those willing to hike the trails in Arches National Park will see what everyone else is missing. Arches National Park is extremely popular and fully deserves all the attention it gets. During the summer, it’s hot with low humidity, and the sun is intense. Eat plenty of food and drink at least one gallon of water each day. 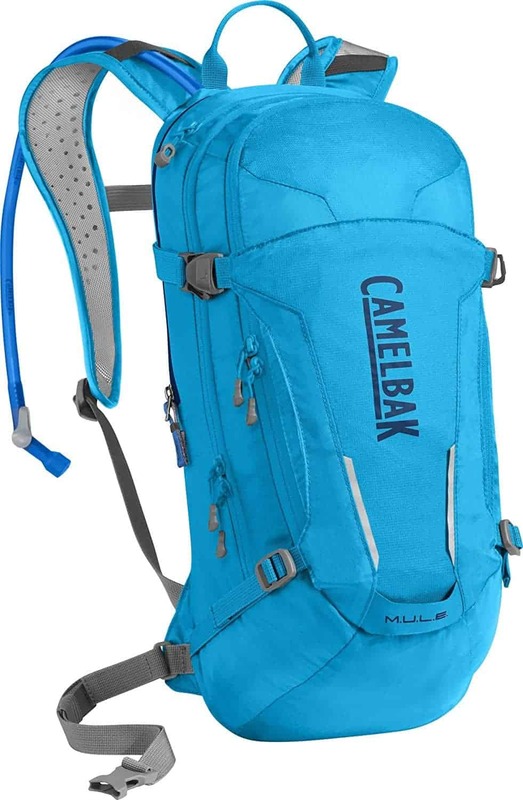 Carry and drink water during all activities, such as hiking. Wear a wide-brimmed hat or UV protection buff. Apply sunscreen to all exposed skin. 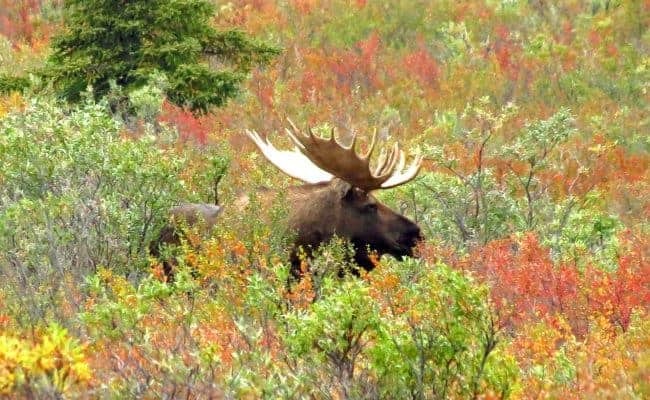 Avoid hiking in the middle of the day. Save strenuous activity for early mornings or evenings. You can get water at the visitor center and at the Devils Garden trailhead and campground. 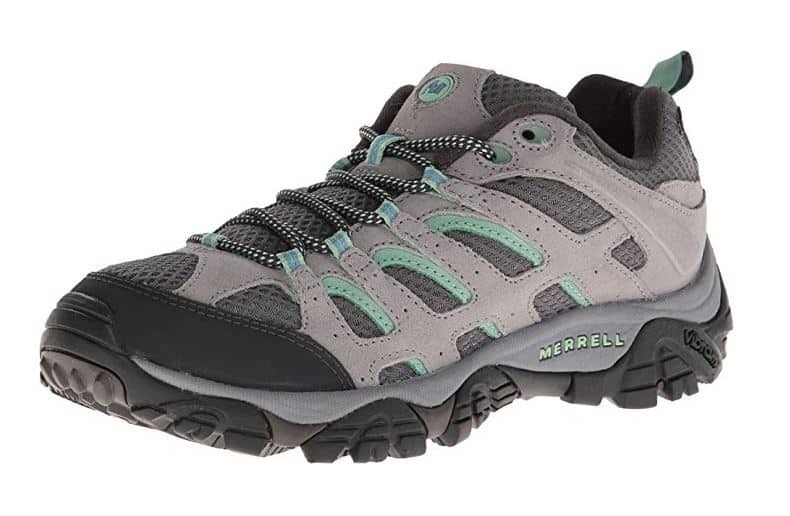 Wear sturdy shoes with enough tread to give you good traction. Do not hike in smooth-soled shoes or boots. Some trails cover uneven terrain and follow rock ledges. In winter, trails may be icy. You may need to wear traction devices on your shoes. Be aware of all potential hazards you could experience at Arches National Park. 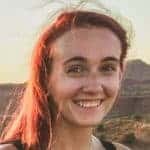 I'm Megan, a Wisconsin native, Utah transplant, American nomad. After taking a few long(ish) trips abroad, I decided in 2016 that I wanted to see more of the US and moved out west. I've been working seasonally at national parks since then, spending summers at Lake Powell, exploring the nearby national parks in my spare time.